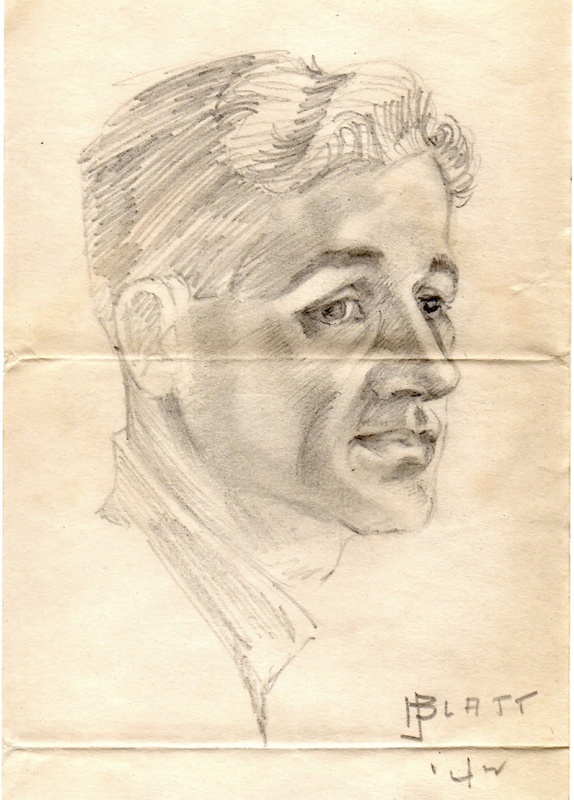 Then in the letter dated August 27, 1942, there was this sketch of Walt by an unnamed guy in his platoon, although the sketch is signed by what looks like J. Blatt. It looks pretty good compared to photos I’ve seen. Unlike photographs, this is interesting in that it captures a moment as perceived by an artist, not a camera. 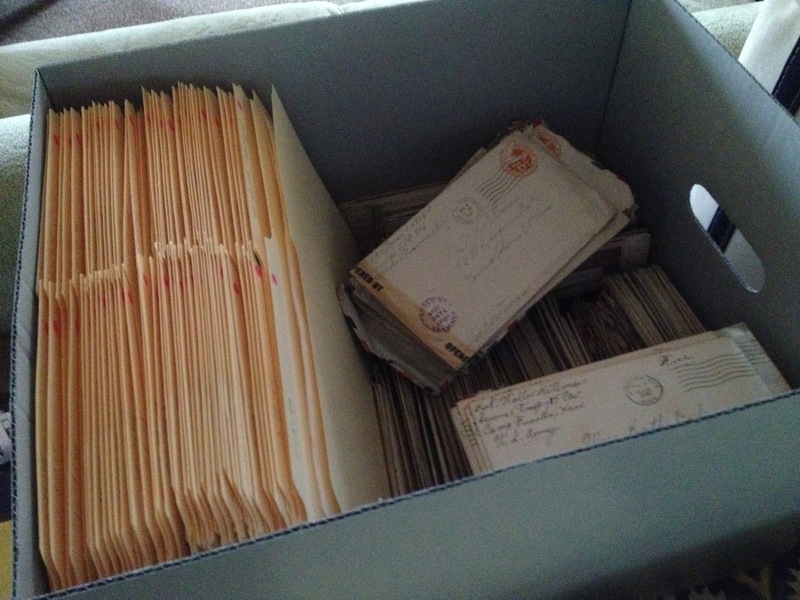 I knew I wouldn’t be done with the project–HA–not even nearly done, but I wanted to have some pieces of all the eventual parts to demonstrate how technology can aid in a task that began with dusty, yellowed, seventy year old letters. I’ll be showing how a blog can be used to document a project, whether a faculty research project, a collaborative course project, or an individual student research project. Then I’ll be showing how database software, in my case Bento, on both the iPad and computer can help organize and make sense of all the pertinent facts of each letter, from basic information like dates and postmarks, to letter topics and keywords. And I’ll be showing how Dropbox lets me access my files anywhere–I’m sure you could similarly work with Google Drive to store images and scans of letters, as well as transcriptions that could be performed right in Google. I’m scanning to high quality PDFs and transcribing in Microsoft Word. Finally, I want to show how it can all be put together in book form with iBooks Author, so even though I am still scanning, I have a few letters transcribed and a lot of ideas for putting a book together. I’ve had to learn about parts of a book, hence this post’s title, as well as about the limitations in the iBooks Author software to name parts. I find that some things can be rearranged, like chapters and sections, but not pages; pages are attached to chapters or sections for good. So, my current scheme looks like it has too many sections, but it is all starting to make sense as I get used to it. I will probably make a mind map of my organization to keep me on track, and the ability to preview your book in iBooks is a big help in seeing what others will see. I hope some faculty in attendance are inspired to try their own hand at bookmaking. You know what happens when you’re dealing with an overwhelming amount of material–you just dive in and get started until you can see some kind of pattern emerge or feel ready to impose one. That’s what I’ve done several times in this project. Recently, after scanning all the Korea letters, and with about half the WWII letters left to scan, it seemed possible to put the remaining ones in chronological order and get an idea of what remains. Why was it a surprise to see that there are no letters from 1943? The 1942 letters are full of references to getting married, with lots of angst about whether it would be possible or if war would interfere. Marriage did prevail–and I knew it–but it never occurred to me that there would be such a huge and decisive gap in the letters. They pick back up in September 1944 and continue to the end of the war in August 1945, but what happened in that first year of marriage? I may never find out, but I can piece together that they must have lived in San Antonio, with my mother returning to Ohio some time in 1944 before the writing begins again, so perhaps they had more than a year together in the interim. Logic also tells me that my mother returned to San Antonio after the war, perhaps in 1945, because my brother was born there in late 1946. I guess you always miss what isn’t there and I’ll be wondering what happened in that year, but it won’t be the last missing piece. There are no letters between 1945 and 1951 and I really wish I knew what those years were like. I skipped ahead and scanned the Korea letters to get that chore over that’s been nagging at me. Had me thinking about Homer’s Odyssey that I’ve taught so many times and how it narrates the great story of Odysseus out of chronological order, beginning almost at the end of his story, then circling around to near the beginning, with a few flashes to the present here and there, and then arriving again where it started to provide a fitting finish to his tale of war and wandering and homecoming. When I’m done with all the scanning and then the transcribing and I have time to put in writing all the essays I’ve been composing in my head, I suppose I’ll start at the end, as well, or the near end, with these letters. 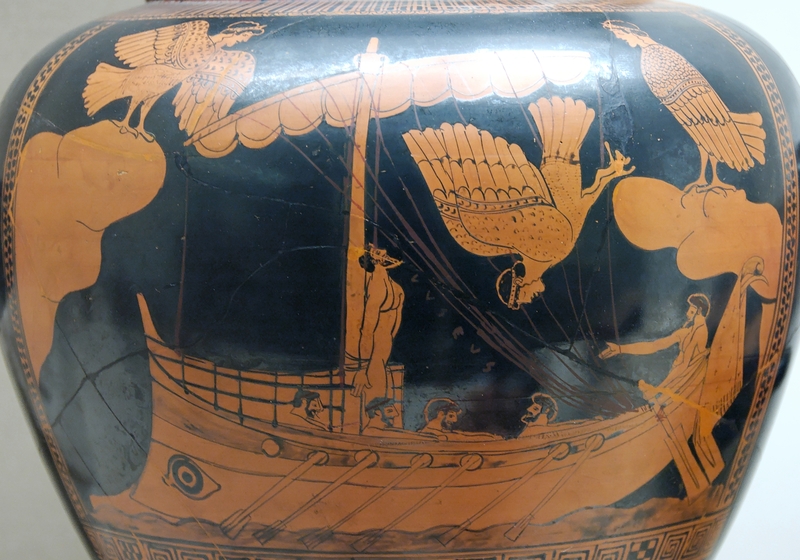 of death from you, Odysseus, light of councils. than lord it over all the exhausted dead. Taking the letters on vacation. On vacation for a week at home, but I toted the box of letters, both those scanned and recorded and those still in the envelopes, with me, because now that they are more than just those letters under the bed, I was conjuring all sorts of scenarios of fire and smoke and water damage or vandalism if I left them for a week. It’s funny how small a package of over 350 letters seems, maybe more so to you than to me now that I know what a time-consuming task it all is and what a huge body of work is represented in the text of the letters. I hope the remaining letters enjoy their last weeks in their comfy envelopes before coming out into the light of day.